Judy Garland decrepit—at age 138—but alive and brimming with fury in dystopian Toronto circa the mid-21st century? And she's preparing research for a PhD dissertation? And the world is apparently run by an Islamic theocracy based in Turkey? And virtual reality is the new black? Sign me up! Since I enjoy dystopian literature (often far more than my students: William Gibson's Neuromancer left a first-year class confused and resentful; ditto Riddley Walker in a second-year class), am fond of camp humour, spent quite a few years anxious and broke (and, yes, obligingly self-absorbed) as a graduate student, and have a passing awareness of Judy Garland, a patron saint of gay men everywhere, the catalogue description of Come Back was irresistible. Upon reading it I contacted a books section editor in Toronto and asked to review it. Cue the adage about judgement, a book, and its cover. Structured as a series of seven responses to an absentee PhD supervisor, the short novel reads as a fervent if long-winded dramatic monologue. At several moments while reading it, I was reminded of Buddy Cole from The Kids in the Hall. In the case of Cole, the bar is the setting, a mere backdrop; the content of the concise skit comes from Cole's attitude, appearance, body language, and, of course, words (and their sibilent-heavy intonation). 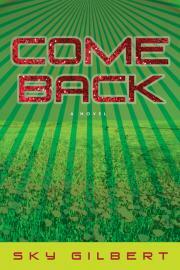 With Come Back, Judy Garland narrates. Dystopian Toronto (and the new global theocracy) replaces Buddy's bar setting. The novelist seems extraordinarily uninterested in exploring the conventional selling-point of dystopian lit: the nature, causes, and/or contradictions of this future society; Toronto/theocracy remains a static painted background that is a distant second to Garland speaking at centre stage. Garland does not spend much time explaining the past fifty years. Instead, she focuses on the decades before her official death in 1969; she pillories her mother and a female star or two who offended her; she defends her father and a few of the men with whom she formed romantic bonds; she talks about her relationship with gay fans. These parts are amusing insofar as the words Gilbert puts in her mouth are raging and caustic. The other key component of Garland's response relates to Dash King, a disillusioned gay graduate student whose life and writings are the proposed subject for her dissertation. King, a figure whose history explicitly echoes that of the author, gives Garland plenty of opportunity to discuss King as an important emblem of gay culture circa the 1990s and to engage with continental philosophers (like Derrida and Foucault) whose popularity spiked in the humanities during the same period. As for what a university and a dissertation looks like circa 2055, and why Garland appears to have no awareness of any thinkers or school of thought that emerged after the 1990s? Come Back displays little concern with fleshing out those minor concerns.